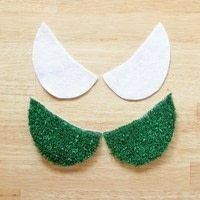 Make a fun peter pan collar to celebrate spring! 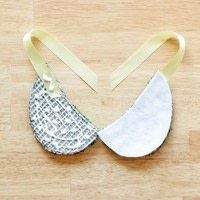 Sometimes I like to get a little wacky with my crafts. In honor of spring, I wanted to make some fun accessories. 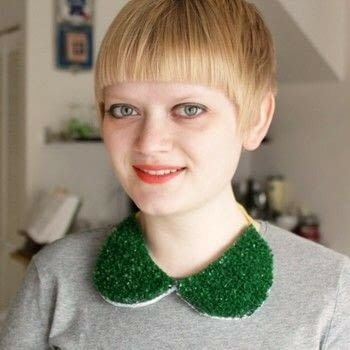 So here's a Peter Pan collar necklace made with astro turf. Yes, wacky, but I like how it turned out! First, let’s talk a little bit about actually getting your hands on astro turf. Really, all you’ve got to do is ask (politely) if the hardware store has any scraps of astro turf laying around from a recent sale. I ended up scoring a 1ish ft. by 7 ft. scrap of astro turf they had rolled up under a counter. Too bad they don’t offer 50% off leftover astro turf ends like craft stores do with fabric remnants… Once you’ve got all your supplies gathered, you should print out my pattern for the collar pieces (make sure to set it to print on one 8.5 by 11 inch standard piece of paper so it’s the right size). Cut out the paper pattern. Trace the pattern onto your felt with your washable marker – once, with the side of the pattern with the text facing upward and once with it facing downward. Trace the same pattern onto the back of your astro turf with your permanent marker the same way – once, words up – once, words down. Cut out both felt pieces and both astro turf pieces. Be warned! Astro turf is super messy when you cut it out. If you’ve ever done a project with faux fur, it’s kind of like that. I recommend vacuuming or sweeping up the green stuff after cutting the turf to avoid green crap blowing all over the place. Turn over your cut astro turf and make sure each piece lines up with a corresponding felt piece. If there is any felt sticking out where it shouldn’t be – past the turf – you can carefully trim it as needed. Sew the two astro turf pieces together with some heavy duty thread and a tapestry needle. Flip the astro turf back over and apply Tacky Glue to the back of it. Cut your ribbon into two 9 to 12 inch pieces, depending in your length preference. Place ribbon on the glue as shown, add a little more glue on top of the ribbon and place the felt backing over the whole thing. Let dry completely before wearing.